Your style preferences. Ceramic, steel, in a plastic or wooden feeder, available as a matching set of bowls etc. Whatever warms the cockles of your heart and makes a nice addition to your home’s interior. 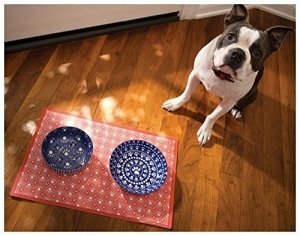 When it comes to dog bowls, ceramic vs stainless steel options are both considered stylish; however, only ceramic pet dishware may feature vivid handmade design. Also, glossy surfaces of these bowls make them safe to soak and easy to clean. Fragility is their only weakness, so make sure neither you nor your pet throws this crockery around. Otherwise, your ceramic bowls may develop small cracks that can harbor nasty bacteria. A delicate ceramic bowl of dinnerware quality. It’s not too capacious and holds just 2.00 cups. Tall sides render it suitable for both water and kibble. It has a very attractive pattern consisting of spots, paws, and speckles mingled together. 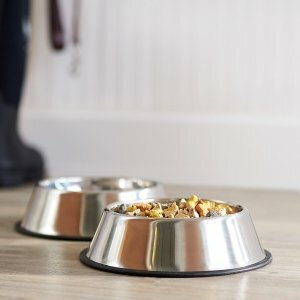 Practical and stoneware-sturdy, this food bowl will serve your pet for years and years. While many other steel dishes with rubber bottoms often fail to stay put, this dish practically does not move around when your doggo empties it with enthusiasm. Its lip is turned in so the bowl prevents water from sloshing out onto the floor. This pet bowl is quite hefty and holds about 1 3/4 cups of food. Several sizes offered by the manufacturer will fit dogs or cats of various age. Feel free to put one of these in a dishwasher or even a microwave – which will surely come in handy for refrigerated dog food. These raised bowls are made of heavy and tough ceramic. Their sage color is tasteful and acts as the complete opposite to an eyesore of an ordinary bowl. Placed symmetrically in a metal holder, the bowls remain immobile thanks to the rubber pieces protecting the glossy outer surface from scratches. 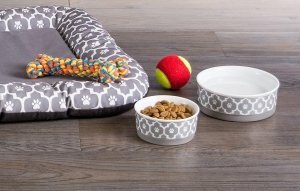 Here we’ve got a perfectly sized ceramic set that won’t require you to fill it with kibble and water more than once a day for a single pet. The set has a moderate height equally comfortable for both younger and older animals. Being made of wood, the bowl base will match your furniture most nicely. The raised design is especially good for your dog’s digestion and prevention of possible gastrointestinal issues. Typically, these stands come with a pair of plastic, ceramic or even stainless steel bowls. The base itself may be made of metal, plastic or wood. 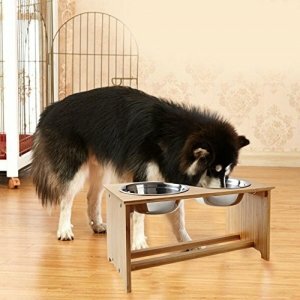 In the case of giant dogs, elevated feeding stations become a direct necessity – if, of course, you want to spare your canine friend a sore neck and trouble swallowing. 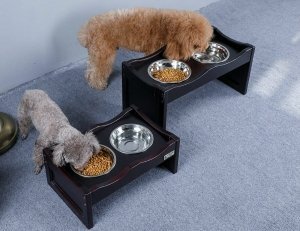 An attractively designed solution to your pet’s trouble with bending over their food. Out of the box, it comes sized for larger dogs; however, you can adjust the height to smaller levels in a matter of seconds. Its construction seems sturdy and well-put-together and even allows you to quickly disassemble it for travel. 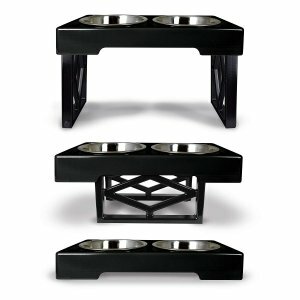 If your dog creates a GREAT DEAL of sound while eating, this rubber-shod pet feeder will be of great service to you. This feeding construction by FOREYY both eliminates the clanking and handles the issue of your dog’s bowl flopping around during their mealtime. Moreover, its surfaces are specially designed to keep away stains and mildew. 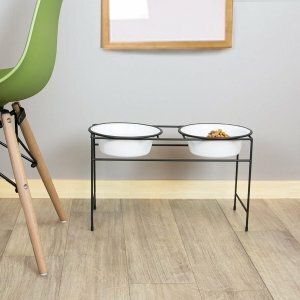 A durable and stable dog food station to make your pet(s) full and happy. Its height is great to allow your dog to swallow easily and facilitate movement of food in their gullet. The bowls are coated with enamel and a glossy finish, which eases up their cleaning. Neater is a well-deserved name for this station. It features a grate that manages to keep food on top and allows water to drain below – and the stand is even more spill-proof with the rubber inserts on the legs. Simultaneously, the catch tray underneath adds to your guarantee against accidental food messes. One more bowl keeper that cares about your floor’s cleanliness. It offers elevated edges to minimize littering and contain occasional spills. You might even like to turn this one in a full-time drinking bench, especially if yours is a multi-dog household. The hard and fast rule with stainless steel pet dishware is to make sure you’ve got a lead-, mercury-, and cadmium-free product on your hands. In all other respects, you and steel will make fast friends – simply because it’s super-hygienic and healthy for all your pets. You can put inside a steel bowl whatever you fancy, including dry, wet food, and dog snacks. Finally – and quite importantly – you won’t need to break a bank to get one of those. This bowl (or bowls if you order a two-pack) sit firm and nice on your floor. Even though your puppy will be able to move them around, you can rest assured your kitchen will stay mess-free and with a dry floor. When the cleaning time comes, you can remove the rubber ring for easy use with a dishwasher. These pet bowls are of an average weight so don’t expect them to sit stolidly while your dog muzzles his/her kibble. What I like best about them is the steep pitch of their sides – they are almost vertical to keep the contents inside. They are also super-easy to handwash and dishwash. 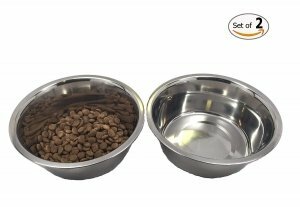 Another excellent stainless steel option for your dog’s feeding time – no chipping or fading, everything’s just shiny clean and sanitary. The mat, too, doesn’t develop cracks or grow stiff. It remains flexible and weighs the bowls down to the floor to fix them in place. This piece of pet crockery is not exactly one of those large dog bowls. Still, it does come as a multipurpose non-aluminum feeder, able to be of good use for smaller and moderately large animals. Its bottom part features a rubber piece to resist slipping on hardwood or tile floors. The bowl’s smooth design is decorated with a bone on the front. 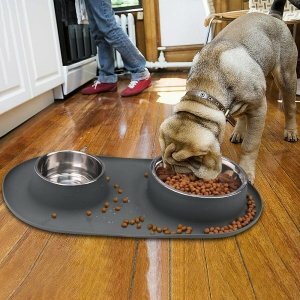 A go-to option for pet owners who prefer preventing the likely food spills rather than dealing with them. The extra-large base of these bowls is both sturdy and perfect for keeping the dog kibble from getting everywhere. 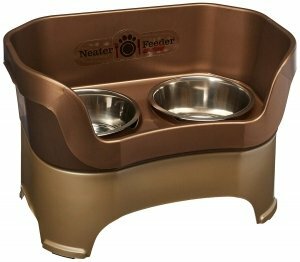 This feeder also eliminates sliding, thus containing water with minimum splashes – and if your dog is as sloppy a drinker as mine, you’ll appreciate this smart design endlessly. 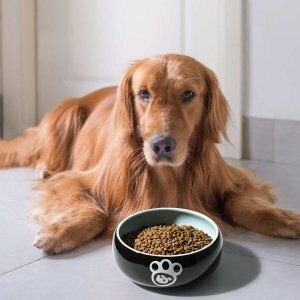 How to Choose Dog Food Bowl? With a wide array of pet food bowls offered in the market today, you’ll have to have a close look at the material, size, color, and design of your preferred option. In reality, much depends on your dog’s behavior – most bowl options will do for quiet or toy breeds, while the vivacious type will likely be able to make a mess with the firmest of feeders. Getting a cheaper ‘test’ bowl might seem a good decision, but make certain you watch it closely as lower quality products may develop rust (steel bowls) or cracks (ceramic ones). On the other hand, it’s always easy to throw away your cheap purchase and get a new, better one. How to Clean a Food Bowl? What kind of gross fungi/bacteria grows in your dog’s bowls are largely determined by the environment, outdoor exposure, as well as fur/oral hygiene of the pet. Pet owners should really treat their animal’s dishware like theirs own, meaning they should wash the bowls at least every day or two, irrespective of whether their dog gets to eat dry or wet food. Use hot soapy water or add any dish detergent available at Target or the nearest convenience store. Dry the bowl both on the inside and outside with a sponge or towel afterwards. Another aspect of keeping your dog’s bowls clean is because of the risk of cross-contamination. Washing the pet feeders in your bathtub or sink is not the best idea if you care that your family doesn’t share with the dog all his/her bugs. Should you have no other option except for a kitchen or bathroom sink, take, at least, strict disinfection measures to counter the contamination. How to Keep Ants out of Dog Food Bowl? You may help this situation by simply trying to put the feeder in a different location. For most people, placing the dog food bowl in a wider bowl of water solves the issue for good. However, if ants are really pestering you by getting everywhere in the house, I’d recommend you to follow the ant trail back to their nest, and then use a bug spray to eliminate them. Or, alternatively, get a bug chalk to draw a line around the bowl – but make sure your dog doesn’t lick or sniff it! I guess care is key when you’re choosing a dog bowl. Special needs of your four-paw friend should be your top priority – such as getting a raised feeder for a long-eared breed is more a necessity than an option. In the case of senile dogs or those with disabilities, you might greatly benefit from visiting a vet to get individual recommendations on the type of dog feeder. Actually, I’ve done hours of research and asking before stopping on a certain bowl for my Richie. For me, all this has been very rewarding – and I hope, you’ll find it useful too! My boxer currently has a food dish that sits on the group and as he gets older it seems that he might be having a hard time eating. 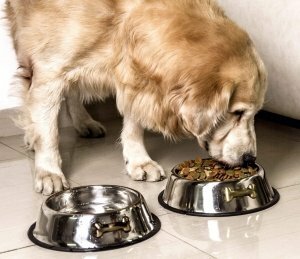 Are raised dog food bowls better for the taller and bigger breeds of dogs? 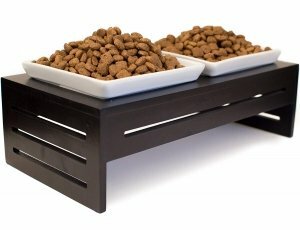 I love the ProsperDog feeder, and that it’s a little elevated The wood finish is my favorite! I haven’t had a whole lot of experience with indoor dogs (most of the ones I’ve had in the past have been big, outdoor dogs who had doghouses and simple stainless steel bowls) but if I was feeding a dog in my kitchen, I’d love that wood finish one. It looks so nice!